In celebration of my fifth post (yay!!!) and because I celebrate one of the most powerful Chicas in Latin music every time I play her music – the dearly departed Celia Cruz, I had to pay homage to this goddess. Her music speaks to my soul, and I could listen to her every day! Honestly, it seems like just yesterday when I saw her perform at an outdoor SummerStage concert in NYC’s Central Park. It was 2002, the year before she died and life would never be the same. Celia was onstage wearing that infectious smile – her exuberant face was pure love, her raspy voice was pure power, her sensational vibe was pure magic and her colorful style was pure creativity. Fast forward to 2009. The tribute musical, “Celia: The Life & Music of Celia Cruz” hit Miami during an international tour and I handled publicity for it. What an honor that was!! As Anissa Gathers took the stage to sing “La vida es un carnaval,” the tears just poured down my face remembering the late singer. Celia grew up in poverty and traded a prospect career as a teacher to sing for the world – and sing for the world she sure did! Her thunderous voice enriched the music industry and our lives forevermore. This is a woman who lived passionately for music, and whose magnificent sound was the most exquisite instrument before a full-featured orchestra. Even today, the unforgettable legend’s music makes you sing out loud, snap your fingers, sway your hips, close your eyes, think about her honest words and feel her charismatic spirit. ¡Azúcar! Consejito: Celia is proof that no matter where you come from, you can manifest your destiny for greatness. After all, it’s written in the stars! Úrsula Hilaria Celia de la Caridad Cruz Alfonso (don’t you just love those long Spanish names?!) lived in a poor area of Havana, Cuba with a house full of fourteen people. She was studying to become a teacher, but singing was her true passion. In fact, her grandmother claimed Celia could sing before she could even talk! She’d sing her siblings to sleep and would belt it out at family gatherings, in the neighborhood and in school. And, she’d listen to guaracha, mambo, bolero, rumba, son cubano and cha-cha on the radio, falling in love with these varied rhythms and musical styles and perfecting her chops. Consejito: To learn more about Celia Cruz’s incredible life in music, pick up “The Absolute Collection Deluxe Edition Box Set” which features stories, memorabilia, never-before-seen photos and 30 incredible tracks. The popular orchestra, “La Sonora Mantancera,” asked her to join their band, and soon after – a career was born! They headlined at the world-famous “Tropicana” nightclub and she shortened her name to Celia Cruz. Together, they recorded many great hits, including “Tu Voz,” “Cao cao, maní picao,” “Nostalgia Cubana” and “Caramelo.” I live for their songs, “Bemba Colorá” and “Burundanga!” Celia winded up leaving her beloved motherland after the 1959 revolution when Fidel Castro took power. Later, after many years, she decided to fly solo. Her husband and lead trumpeter, Pedro Knight, also left the band to become her full-time manager and onstage musical director. Success was at Celia’s feet as she continued a journey that would change the world of music forevermore. She brought her jubilant personality, artistry and supreme sense of fashion style to the group, “Fania All Stars.” Together, they performed salsa music in the Caribbean, North America, Latin America, England, France and much of Europe. Despite not being granted permission to enter Cuba, even when tragedy struck and she wanted to attend her father’s funeral, Celia got to perform on Guantanamo Bay Naval Base. It’s such a shame she wasn’t able to walk the streets of her old neighborhood in Santos Suárez. During an illustrious career spanning more than five decades, Celia performed and collaborated with many other big name talents: Tito Puente (my favorite song of theirs is “La Guarachera”), Willie Colón, Johnny Pacheco (OMG, I love “Químbara” so much! ), Ray Barretto, Emilio Estefan, David Byrne, Larry Harlow, Willy Chirino, Patty Labelle, Luciano Pavarotti, Sergio George, Caetano Veloso, Wyclef Jean and others. Clearly, the iconic singer was unstoppable. Celia also accomplished a stage, TV and film career – appearing in several big screen movies including “Mambo Kings,” Mexican telenovelas and even an opera at Carnegie Hall. Having recorded more than seventy albums during a career spanning five decades, she garnered a substantial share of accolades: a multitude of certified platinum and gold albums, three Grammy Awards, four Latin Grammy Awards, three Billboard Awards, five Premio Lo Nuestro Awards, ten Grammy Award nominations and four Premio Lo Nuestro nominations. But that wasn’t all for the trailblazer as the list of prestigious honors bestowed on her is endless. Celia was given a star on the Hollywood Walk of Fame, received a Presidential National Medal of Arts and was awarded a “Lifetime Achievement Award” by the Smithsonian Institution. She has a sculpture in the Hollywood Wax Museum, was listed in the Guinness World Record Book as the “Longest Working Career as Salsa Artist” and received an Honorary Doctoral Degree of Music from Yale University among other universities. There is nothing this talented Chica couldn’t do with her larger-than-life voice, onscreen razzle-dazzle and superstar persona. She sang her heart out, and the public sang her praises. From Hollywood to Mexico to Zaire to Spain, all corners of the globe fell in love with “La Guarachera de Cuba.” Unfortunately, a grave illness put a halt to Celia’s ever-expanding career when she died in 2003 of brain cancer. Her body was taken on a tour, allowing droves of fans in NYC and Miami to pay their final respects. The world mourned her passing as many memorials were held across several countries. For someone with twenty-three gold records, Celia also had a heart of gold. She came from humble beginnings, and never lost sight of this. Another reason to love her, really. Before she died, the humanitarian and her husband started a non-profit, The Celia Cruz Foundation to raise much-needed financial aid for poor children who want to study music and also provide funds to help cancer patients. Celia’s glorious spirit will always remain in my heart, and her legacy lives on through the beautiful music she left behind. 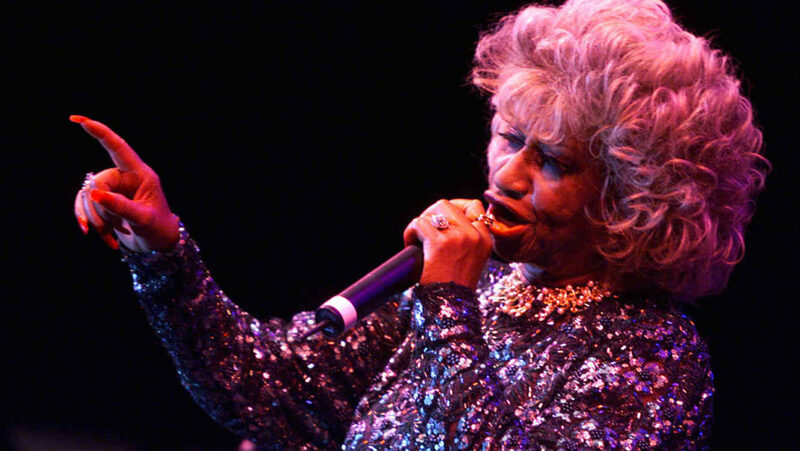 Chicas, what is your favorite Celia Cruz song? I’d love to hear from you!! Previous Previous post: Wine flies when you’re having fun. ¡Salud! Next Next post: Tropic Like It’s HOT!